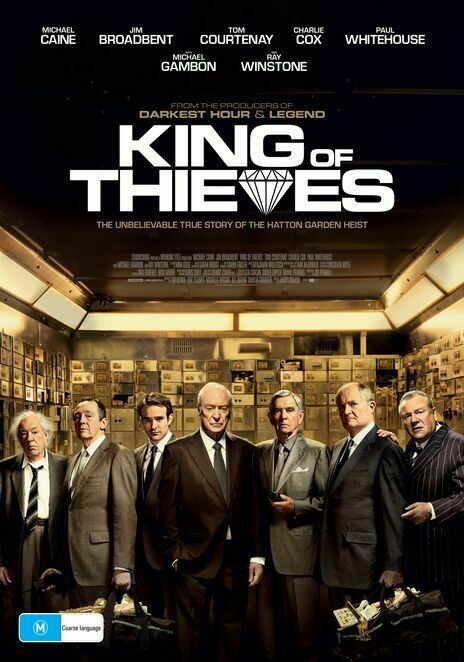 King of Thieves, directed by James Marsh (Man on Wire) arrived in Australian cinemas quite late, having been first released in September of 2018 in Ireland. The film is a crime/drama based on a true story, and much like Clint Eastwood's The Mule, it brings great experience and talent in the acting department, however, this film is very much an ensemble piece, where The Mule was a solo project. The film basically pretends that Michael Caine's character Brian Reader, a life long criminal who's wife has just died, is the main character of the story. We spend the first part of the story with Reader and his wife, followed quickly by her funeral. This portion of the film feels in line with recent (and excellent) TV show After Life (Ricky Gervais). However, the film moves quickly on from this and brings together a ragtag group of old school criminals and one young tech head who has the idea of a heist. The crew is littered with great actors, particularly Jim Broadbent, who plays nasty much more effectively than you might imagine if you only know him from the Harry Potter series. Ray Winstone also gives a tough performance, as these old bitter men struggle against the clock of both pulling the job off and the onset of old age. This film, however, is not Ocean's 11 with old men. The crime is fairly straight forward, shown in the way your dad might come over and help you fix the bathroom sink. The banter between the characters is both funny and unpleasant. The humour is there at times, but very much in the way old friends might bicker. It's certainly not in the Ocean's 11 style, with slick one-liners and clever double-crosses. The police investigating the case are given no character what so ever, with virtually no dialogue, making them just a plot point and nothing more. The first two-thirds of the movie is very enjoyable. However, sadly, Michael Caine's character doesn't stay with the group, and from here, the film doesn't quite know how to get to the end in a satisfying way. The lack of Hollywood glitz, whilst a nice change and more realistic, ultimately doesn't support the narrative to be entertaining and the ending just kind of arrives without fanfare, leaving you feeling full, but from eating too many appetisers and not a main meal. The cast is the main reason to see the film. Caine is in his usual form, and as I stated, Winstone is very good in a role that overall, felt like it had more impact on the story.